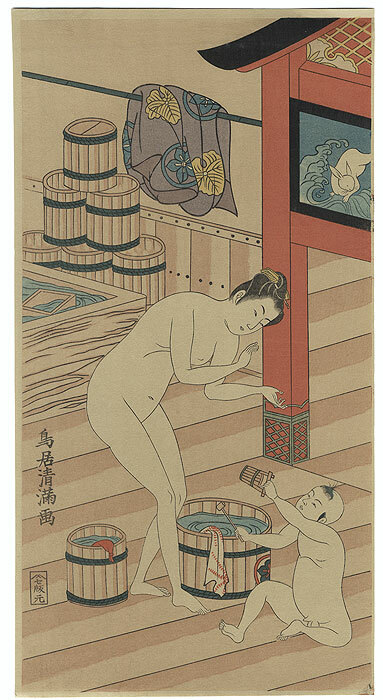 Comments - Charming image of a mother and her young son at a bathhouse. The child plays with a miniature wooden pail and dipper as his mother claps her hands delightedly. Her kimono is hung over a bar above stacks of buckets next to a large pool. A handsome reprint of this classic 18th century scene. Condition - This print with excellent color and detail as shown. Slight paper remnants on reverse at top edge from previous mounting. A couple light creases at edges. Please see photos for details. Good overall.